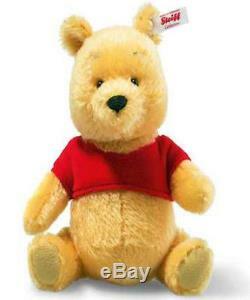 DISNEY MINIATURE WINNIE THE POOH BEAR 22CM. STEIFF DISNEY MINIATURE POOH BEAR - WINNIE THE POOH - A LICENSED STEIFF CHARACTER 683411 22CM Licensed products are within the Steiff range of bears and this means that they have been given a licence to entitle them to make some of the famous characters from cartoons and films. Enthusiasts and collectors are facinated by how Steiff have interpreted them and how authentic they are to the original and love seeing their favourite character come to life....... Just like this wonderful addition to their growing range. Size: 22cm (9) Limited to 2000 - Exclusive to the UK & USA. Walt Disney loved reading Winnie The Pooh stories to his daughter and he acquired the rights to the character from A. Milne in the early 1960's. He modernised his look for his first screen appearance in "Winnie The Pooh and the Honey Tree" and this is now the definitive version of the character, recognised by all. He is 5 way jointed, at the arms, legs and head and you can see that he loves honey, as he has a big, rounded tummy! Winnie The Pooh is loved by all and no Pooh, Steiff or Disney Collection is complete without it! Winnie The Pooh is the first character to be released in a new series of characters from the Hundred Acre Wood... So look out for more to come!! He has the famous "Button in Ear" and a white label, showing that he is only limited to 2000 pieces worldwide, making it very collectable. Free Steiff presentation box and numbered limited edition certificate of authenticity This product is not a toy and is intended for adult collectors only. If used by any other party, further action will be taken. The item "Steiff Limited Edition Disney Miniature Winnie The Pooh Bear EAN 683411 Box/Cert" is in sale since Sunday, October 14, 2018. This item is in the category "Dolls & Bears\Bears\Artist\Manufactured". The seller is "corfebears" and is located in Swanage. This item can be shipped to United Kingdom, Antigua and barbuda, Austria, Belgium, Bulgaria, Croatia, Cyprus, Czech republic, Denmark, Estonia, Finland, France, Germany, Greece, Hungary, Ireland, Italy, Latvia, Lithuania, Luxembourg, Malta, Netherlands, Poland, Portugal, Romania, Slovakia, Slovenia, Spain, Sweden, Australia, United States, Canada, Brazil, Japan, New Zealand, China, Israel, Hong Kong, Norway, Indonesia, Malaysia, Mexico, Singapore, South Korea, Switzerland, Taiwan, Thailand, Bangladesh, Belize, Bermuda, Bolivia, Barbados, Brunei darussalam, Cayman islands, Dominica, Ecuador, Egypt, Guernsey, Gibraltar, Guadeloupe, Grenada, French guiana, Iceland, Jersey, Jordan, Cambodia, Saint kitts and nevis, Saint lucia, Liechtenstein, Sri lanka, Macao, Monaco, Maldives, Montserrat, Martinique, Nicaragua, Oman, Pakistan, Peru, Paraguay, Reunion, Turks and caicos islands, Aruba, Saudi arabia, South africa, United arab emirates, Ukraine, Chile.